Blue pants. Omelet for me two fried eggs on toast for Rob. As a side note on the breakfast habits of your two heroes, rob always goes for bacon and fried tomato with his and I cruise the Indian side dishes, having a couple of dhals, a nutty rice thing, mystery pakora and couple of rotis. Met up with our guide Bunty, yes it was a bloke. Whisked off through oncoming traffic flows to a car park entrance, which looked like the normal demolition site we have come to accept as normal for an Indian town centre. We were instantly fallen on by hordes of vendors selling yellow(sorry saffron) head scarves as this is the required headgear for the golden temple. 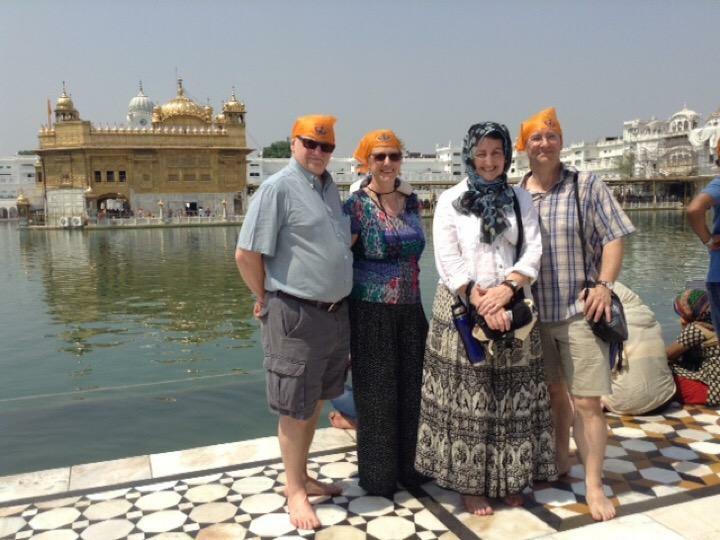 We have been told how the golden temple is a haven of peace and tranquility. We set of from the car through a market which even by Indian standards was chaotic. Arrived at the temple entrance and handed in the shoes and walked through the cooling water bath and into the temple. The centre is truly amazing with the very golden temple set in the middle of a lake. We walked around the edge in the cool corridors with people sitting around meditating and yes it was very peaceful and calming. We then went to the voluntary kitchens which can feed 200,000 people a day. This is all prepared, cooked, and washed up on site by volunteers. We watched the automatic naan machine first then went onto the 'kitchen' area where the vegetables were all be cut and prepared, then huge vats where the food was cooked. After eating there was a human chain taking the trays to be washed by hand, there appeared to be a 4 station system where the plates are all washed 4 times before standing and drying. The noise and movement of people was awe inspiring and I was all ready to leap in and help but we were pushed on and had to leave. Not before the obligatory selfies from groups of Indian families. We then went into the Golden temple itself and saw all the gold leaf work, inlaid marble and scroll work. Went up to roof and looked over the whole impressive area. The whole time we were there there is a live feed of the chanting of the holy book from the centre of the temple, when we came off the roof I went round the back to find Vic and got caught in the chanter changeover ceremony and had to stand stock still with my hand firmly pressed together, when Julie came round to see where I was she got caught as well and joined in the game of statues. Rob then came to see what was taking so long and was made to stand rigour mortis like. Eventually escaped and headed back out the temple through the never ending sessions of selfies and family group shots. Next we went onto the Jallianwala Baga where in 1919 the British shot dead 158 unarmed peaceful protesters and another 200 drowned when they jumped into the well in an attempt to avoid the hail of bullets. Not our finest hour, all this was told to us by a very serious faced Bunty, the affect only being slightly blunted by groups of Indians wanting to shake our hands and take pictures of us. As with all Indian history lessons we have been told about the evil British Empire no mention is made of the mass slaughters of innocents that have happened since 1947. Hey ho. Vic now suffering from the heat again so off back to the hotel for a snooze and a rest. Out in the evening to the shopping centre next door where Rob and I made another intrepid explorers discovery, a micro brewery. Felt it was important to support the local economy while watching another IPL match. Another boring quiet day really.